Fashion trends are changing almost everyday and knowing what to wear to flatter our body shape is always a challenge that most women face everyday. These challenges typically occur from getting change in the morning to go to work, getting dressed to attend a wedding, dressing up for a night out, getting dressed for sightseeing and travel and pretty much the never ending decisions. I, myself have been struggling with the challenges I face whenever I get dressed to go out and even for any occasion. Whenever I get invited to any parties, I often don’t think too hard on the type of dress to wear as it really does stress me out. While on the other hand, I do get stressed out thinking “what kind of dress should I wear” for sightseeing and travel. Yes! You hear me, right? 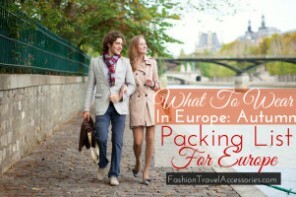 I have limited time to think and get ready in the morning while on a vacation so I really have to think in advance or the night before so I’m not wasting my time unpacking my suitcase searching for the best dress to wear for daytime and that is also appropriate for exploring the best cities in Europe. I always say that Fashion is essential and is definitely a part of my life and so as to most fashionistas. We can easily create our clothing in order to have a positive effect on our body and in our typical daily life. I wrote a post in relation to Fashion is not the only solution to boost our self-confidence. There are of course lots of things we could do to improve our confidence and self-esteem. In this article, I will be illustrating different types of dresses you could wear for any occasion. Do you want to know more and find out my tips, read on below. Sheath dress is my favourite type of dress, as it can be worn for work, cocktail parties, wedding and even for sightseeing in some parts of Europe (depending on the fabric, style and the weather). Sheath dress typically falls around the knees or just above the knees or lower thighs. Also, a real sheath dress usually just slightly hug or touch the body but it does not completely cling tightly unlike the bodycon or bandage dresses. Wearing sheath dresses can also slightly show off your figure, which at the same time it allows you to still hide some love handles around your waist if it’s required. This is the reason why I love wearing sheath dress whether it’s for casual wear, formal events, sightseeing and even for work, there are a variety of fabric styles to choose from that can be suited for any occasion. Sheath dresses are also chic, elegant, sophisticated and slight touch of sexiness. It does not make you look tacky and slutty. I also like bodycon type of dress but I don’t love it as much as the sheath dress. This is because a bodycon dress can be so tight that it literally clings or hug your body. Now imagine if you don’t have a perfect hourglass shape and some small bits of folds or love handles around your waist are sticking out, do you think that would look so flattering? Hmmm, no I don’t think so, definitely not for me. Fortunately, there are some types of bodycon dresses that can easily be worn depending on the types of fabrics. And if you happen to find a beautiful bodycon dress but feeling a bit too conscious with your shape then I highly suggest you wear some shapewear underneath. This will give you an hourglass shape. Bodycon is typically worn in cocktail parties, weddings and it’s available in different sizes and length. Most bodycon usually falls around the thighs, knees and some can be found in longer length. It can also be worn in any occasion whether you’re going to a party, to the beach or sightseeing and traveling. It all depends on the length, the types of fabrics and style. Personally, I won’t feel too comfortable wearing a bodycon for work (in the office environment) unless perhaps it’s sophisticated yet simple style. Fit and flare dress is one of the most popular dress trends you could easily wear anytime of the day whether it be for work, cocktail parties, weddings, formal events, summer adventures and sightseeing in a new country. This type of dress is one of my go to dresses especially if I’m feeling a little unfit and self-conscious. The fit and flare chic flattering silhouette is fitted nicely through your body and then it flares out into a nice fuller skirt. This type of dress is definitely suited for voluptuous women and for those with pear or apple body shape. This is because it accentuates the hips and making your waist a little flatter and slimmer. This is one of the reasons why I love wearing fit and flare dresses, as I can easily hide my love handles. Here is a beautiful peach fit and flare dress by Ellie Tahara made of 70% triacetate and 30% polyester with zipper closure, fluid crepe and colorblocking. Another favourite of mine is a long sleeve pastel grey colour fit and flare dress by BCBGMax Azria made of 97% rayon and 3% spandex. Featuring zipper for closure, round neckline and contrast panels at the centre in front and back. It also has a seamed waistline, A-line silhouette that stops just above the knee and a beautifully constructed all over fishnet mesh. Shirt dresses were very popular back in the 1950s and now they have been revived and are currently trending again. This type of dress is suitable for any types of body shapes. It’s flattering, edgy, chic and bohemian all mixed into one. This type of dress is also versatile, as it can easily be worn in any occasion particularly more appropriate for daily casual wear, work, sightseeing, travel and date nights. There are different types of pleats, which are box, knife, double and cartridge pleats. All of which are formed and sewn in a wide fabric either to make a dress or skirt. The pleated type of dress was very popular back in the 50s-60s and it’s definitely trending again. You might have noticed that the pleated dress is very similar to fit and flare dress due to its flared fuller skirt and fitted upper part. But you can definitely tell the difference between the two. The pleated type of dress is most commonly worn in formal events or special occasion such as weddings and formal parties. Though there are some pleated dress that are also appropriate for office work environment. Chiffon dresses typically have different layers of fabric made of cotton, silk and synthetic fibers. It flows beautifully into fuller skirt that is super lightweight. It’s most commonly worn in evening wear, formal events, weddings, as it looks elegant with floating appearance. Personally, I would only wear this type of dress to a formal party or special occasion as the fabric is too elegant for a casual wear, sightseeing and for work. Occasionally, I wouldn’t mind wearing this for a cocktail party depending on how formal it is and type of fabric and style. Here you have all the different types of dresses to choose from. Which ones are your favourite dresses to wear in any occassion? Share your thoughts in the comment below.